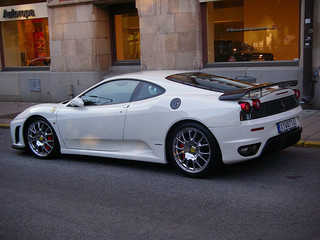 The six year production run of the Ferrari 360 sports car finally came to an end in 2005. However, its successor, the two seater, mid-engined, Ferrari F430 was waiting in the wings, and was duly launched in 2004 at the Paris Motor Show. The entry level model had a price tag of almost $187,000. 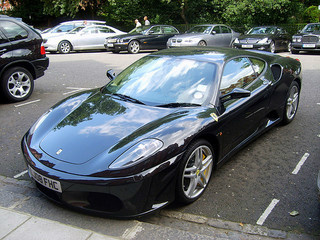 The F430's aerodynamic styling by Pininfarina had substantially increased down force compared with the 360 due, in part, to the addition of a spoiler underneath the front bumper. Air flow deflectors were added to the rear to increase the ground effect, so adding to the down force. There were two air intakes at the front linked to another spoiler channelling air to beneath the car. However, even with all these additions, the overall drag coefficient remained unchanged. The result was that the new car had an outward appearance noticeably different from that of its predecessor. It was fitted with Brembo discs all round, which were composed of an alloy whose constituents produced improvements in heat dissipation under heavy or prolonged braking. As an optioanal extra, composite ceramic discs, with much longer anti-fade characteristics, were offered as an alternative. 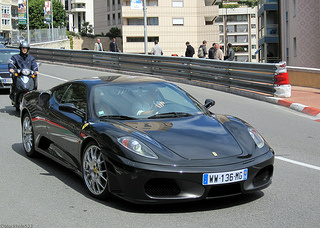 The F430 sports car employed a computer activated limited slip differential unit, referred to as E-Diff, which automatically controlled the allocation of power to the wheels in accordance with prevailing road conditions. It was available on both F1-style paddle shift or manual six speed gearbox models. The electronic differential E-Diff had been used in single-seater racers for many years and, on the track, it ensured maximum grip when cornering, so preventing wheel spin. The five-setting Manettino switch was widely used in racing, and both it and the red starter button were positioned on the steering wheel. 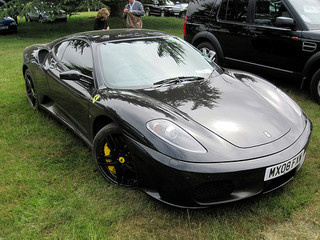 The F430 used 19 inch wheels, and was fitted with Goodyear tyres specific to the car. Unlike the 360, the interior of the F430 sports car was designed to contain only necessary luxuries and features, which was part of a new minimalist approach by Ferrari. The car featured an aluminium body, chassis and engine, whilst the cockpit area had been increased, and offered excellent levels of passenger comfort, with sufficient space behind the seats for necessary essentials. The 360 was the last Ferrari V8 engine to be based on the design first enunciated with the race engines of the 1950's. Following Ferrari's acquisition of Maserati, the company designed a 4.2 litre, V8 engine specifically for Maserati. This was subsequently increased to 4.3 litre, with a longer stroke, which enabled it to rev higher. The new 4.3 litre, twin overhead cam, V8 engine, with a flat-plane crank, 11.3:1 compression, and based on the Maserati unit, developed 483 bhp at 8500 rpm (the redline), and 343 ft/lbs of torque at 5250 rpm, of which the greater majority was on tap at around 3500 rpm. 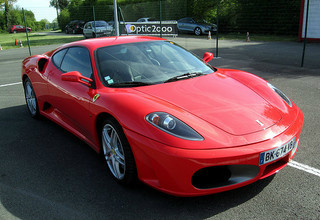 In terms of performance, the F430 had a top speed of 196 mph, with a 0-62 mph time of 3.9 secs. Compared with the 360 engine, this represented 25% more torque, and a 22 % increase in output. In a departure from the 360 unit with five valves per cylinder, the F430 engine reverted back to the more conventional four valve layout. Additionally, it was fitted with a completely different crankshaft, pistons, and con rods. Even though the engine capacity was increased by 0.5 litre, it was only 4 kg heavier, and was actually slightly smaller, which increased its versatility. A Ferrari F430 sports car in good condition would fetch around $120,000, whilst an example in excellent condition could command around $150,000. 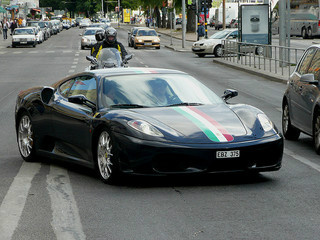 Another classic car from Ferrari.